Before I knew what a mind map was, I was mind mapping. Using scrap paper and pen I worked out some of the more difficult lines of association comprising the worm hole structure of my novel Flicker in the Porthole Glass. 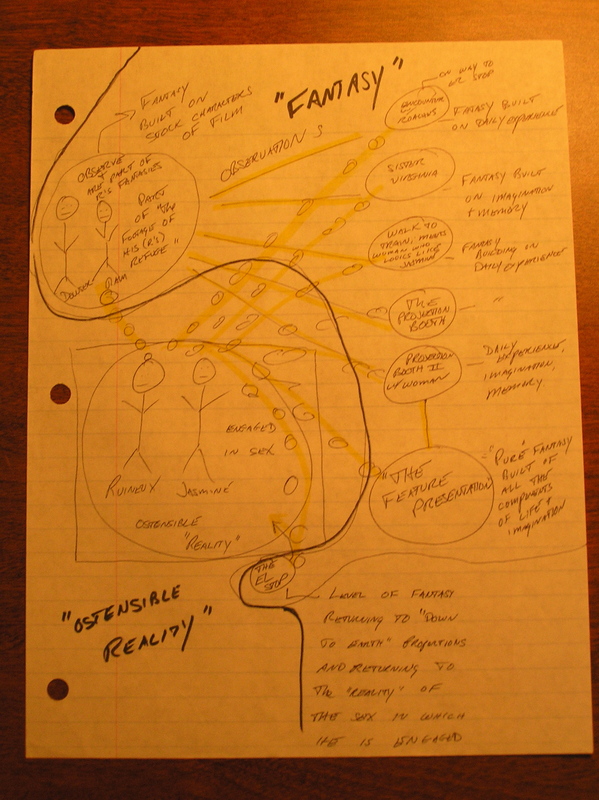 The following artifact shows a mind mapping exercise I completed sometime in 1993 over a couple afternoon hours–and several pints–in the cozy dark atmosphere of Zeno’s on Allen Street, State College, PA. (You can see a more detailed view here). At some point, the activity of mind mapping moved into the broader culture and today there are numerous software programs available to support it. Though I’d vowed never to do another structurally complex novel after Flicker, it seems I can’t help myself–it’s just the way I’m wired. So, I’ve once again practiced a bit of mind mapping to better understand the various lines of association emerging in the work. This time, however, I’m using software. 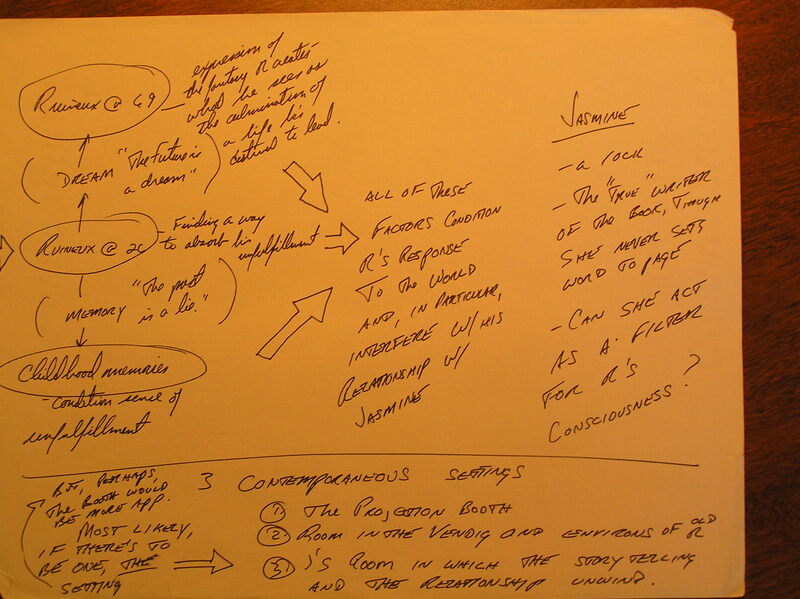 The following is an in-progress mind map for my in-progress novel, Housebreaking the Muse. I used a free application called FreeMind, but there are many other free and (probably more full featured) fee-based applications available. (You can have a better look here. 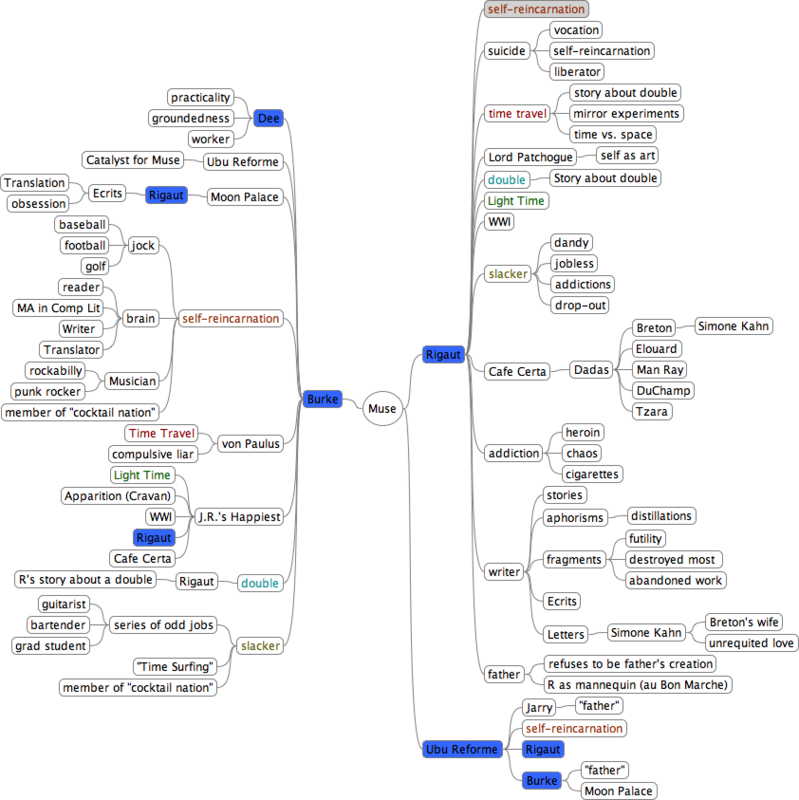 I encourage fellow novelists and other writers to have a look at the Wikipedia article on Mind Maps and give it a whirl. Try on on paper first, preferably with your favorite bevvy at hand. If you find the process helpful, you might try looking into the man mind mapping applications available. Have fun! Good one. same thing here. We indirectly used mind mapping. But now free mind and other application they make it more clear. I think it frees you up, compared to trying to outline. It shows you things a mere outline can’t. Even when using mind mapping software I find the process more “analogue” / less “digital”–which I suppose aligns with the mind of a fiction writer! Do you know that mankind has been using gravity since existance but not until sir Isaac Newton did they new the formulation and what it was and put it to further uses! Thank you for this interesting post. I’ve just bought my first mindmap tool and this is ConceptDraw MindMap7. My initial impression of the product was good and I could use the program intuitively without any tutorials or training. When I write an article I need to be able to easily migrate from mindmap to MS Word and backwards to analyse all the parts of the story so Conceptdraw Mindmap allows me to do that. Check http://www.conceptdraw.com/products/mind-map/ – it have the best round-trip import export with MS Word and Evernote I ever seen, plus it perfectly handles with pictures inserted to Word and mindmaps.